Angkor Wat. A temple complex, the largest religious complex in the world. A UNESCO world heritage site and symbol of Khmer architecture and Cambodia. Patience and different perspectives can make it seem like you are on an exploration exhibition, opposed to one in a crowd of a million. 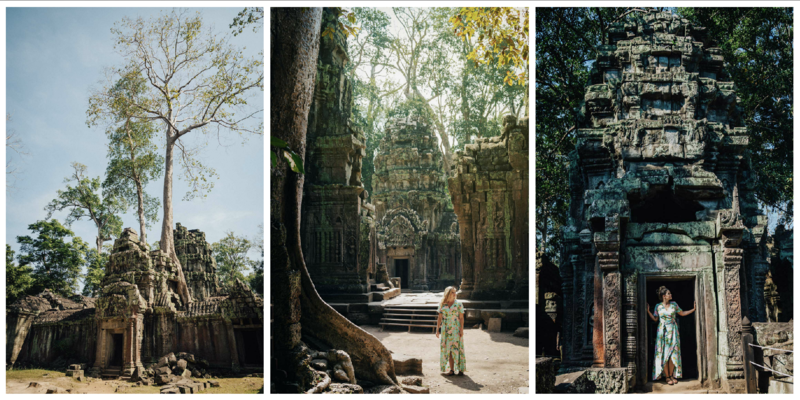 We spent three full days at Angkor Wat, which in retrospect did not even begin to scratch the surface all of the wonderful treasures this heritage site holds within her. This is a place where you can not simply go from site to site and check it off your list. I mean you technically could do that, and many people do, but then you would be missing out on all of the details, impressions and magic that make this place one of the 7 wonders of the world. Jason and I rented bicycles from Siem Reap and cruised around some of the main temples. Doing so allowed us to see it more on our own time, finding all the hidden details that you might not notice zooming by in a tuk tuk, checking off a list. While the main temple of Angkor Wat is crowded and loud, the majority of the temples are peaceful, and quiet. You can sneak off to your own corner of architectural wonder and sit and listen to the birds cheap, and insects buzz, and lose yourself completely as you drift transcendentally back through time. The best part of taking these temples slowly… and I mean slowly, is that it allows for you to take the time to get the perfect shot. Lets be honest, I mean, we all just really want to take home some great vacation photos when you are visiting somewhere as cool as Angkor Wat. 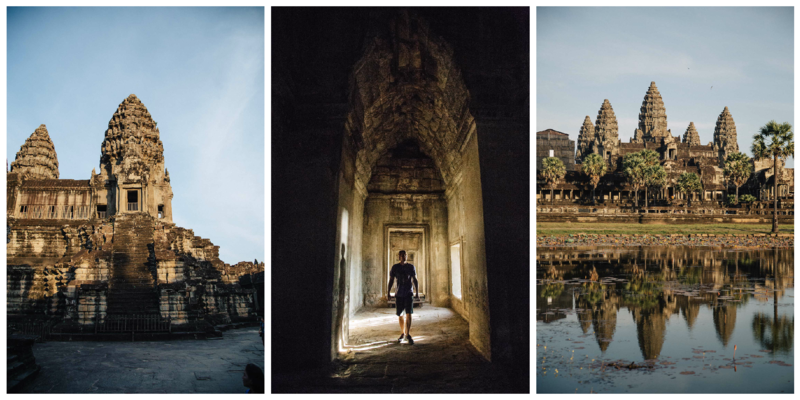 Here are my top 7 tips to getting great photos in Angkor Wat. Get there early. Whether you are waking up to capture the sunrise at Angkor Wat, or just want to beat the crowds, waking up and getting there early is worth it for several reasons. The best lighting on most of the temples is in the early morning. This soft golden light will add just the right amount of contrast to your photos. Not only will it allow for optimal lighting, you will have the temples largely to yourself (barring Angkor Wat.) Going early also means that you can catch the quintessential sunrise at Angkor Wat. For this you really have to be an early bird. Jason and I were at the gate at 4:45am and there were already hoards of people lining up past us. As soon as the gate opens at 5am there was a mad dash to the best photo spots. Ashamed to say I mad dashed too because by George if someone is going to take my spot when I woke up at 3:00am for this! Once you get to your spot, claim it well. I staked my claim in the name of manfrotto as far to the waters edge as possible so that no one could come in front of me and ruin my shot. Make sure you do the same or people will try to wriggle their way to the front. Scout it out. First thing is first, in order to get that amazing sunrise shot of Angkor Wat you have to scout it out. Jason and I went on the first evening of our pass to scout out a few things. Once you have your pass you can actually spend the afternoon at Angkor Wat after 5pm without being “charged” for the day. We used this time to go see the temple and figure out where would be the best spot for our picture. I tried from the far left and from the far right, and in my opinion the far left offers the best view of the Wat. That morning light is limited, not to mention when you get there it will be pitch black, and you want to be efficient so scouting ahead of time will help you create a good plan of action. View from the left hand side of the left pond, and view from the right side of the pond on the opposite pond. Be Patient and get Creative. Okok, I guess this is really a 2 for 1, but they really go hand in hand with this kind of photography. One of my favorite shots we got is from the Ta Prohm temple. This temple is a popular temple known as the Tomb Raider temple, and that means it is crowded. Like, really really crowded. There is a maintained line the whole day through to get your picture with the famous tree overgrowing the temple. there will always be a crowd there, it will never look like you are alone. But the nice thing about that is that people are so concerned with that particular photo, they kind of miss out on the other, perhaps better, photo opportunities you can get in different less traveled areas of the temple. Jason and I found our own really cool perspective at the temple and wanted to capture it without people in the background. It took a pit of patience and waiting, but eventually we had our opportunity and were able to snap this with no one around. Stay Late. Again, the lighting at the end of the day is almost as nice as the lighting at the beginning of the day, maybe even better. Jason and I spent one afternoon just walking around Angkor Wat as it got more and more empty. Suddenly, we were the last people leaving. On our way out there was still just enough light for me to look back and snap this magnificent beauty with no one in the shot. The light was nearly gone but I like the muted colors that go hand in hand with how ancient the temple is. Last to leave. Wait for everyone to clear out of the temple in the afternoon and you can snap this shot with no one in the picture. Pick your lens. So when I shoot places I most often will go with my most dynamic camera lens, my 24-105. This camera is great with getting pretty wide, and also zooming in close for details. It makes my life easy. For architecture I will also sometimes bring my 16-35. This super wide angle can make it possible for me to get a shot that might not be possible with my other lens. I can also get closer with that lens, and still keep everything within the frame, but might be able to knock a few people out of the shot. Bring a tripod. Ok, lugging around a tripod while bicycling around all day is not ideal, but if you want pictures of yourself, or nice sunrise pictures, this is absolutely necessary. When I took my sunrise picture of Angkor Wat I didn’t have to lower the quality of my photo by upping my ISO and making the photo more grainy. I just lengthened my shutter speed in order to allow more light to come in. To do this, duh, I need a tripod. While other peoples pictures were coming out grainy, blurry, dark and grey, my photos were perfectly sharp, bright, and silky smooth. Tripods are a great way to get shots of yourself that you may not otherwise be able to get. Shoot Multiple exposures. This goes hand in hand with bringing a tripod. If you want that perfect picture with no one in the background, sometimes you need to work a little photoshop magic. The easiest way to do that is shoot multiple exposures of the same scene and merge them together to get rid of the people. This is a great technique I have used for places like the Taj Mahal (albeit without a tripod), where no amount of patience will clear out that amount of people. Keep these tips in mind, and commit to taking amazing pictures on your travels. For me pictures are the most important part of traveling. 1. Because I LOVE taking, editing, and sharing my pictures. And 2. Because I have the memory of a merecat and the only way to keep these moments fresh in my mind is a visual reminder. 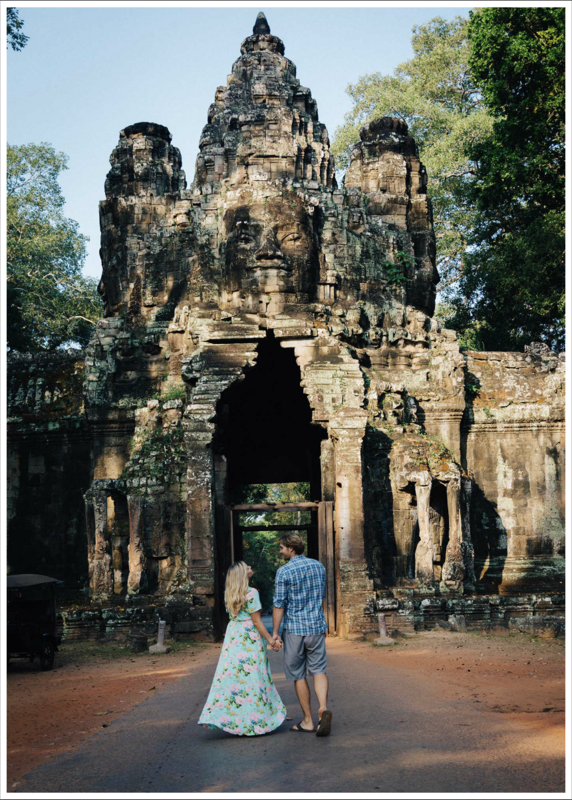 I hope these tips help you for your pictures of Angkor Wat, or any of the other wonders of the world. Sometimes monkeys make the best subject matter. 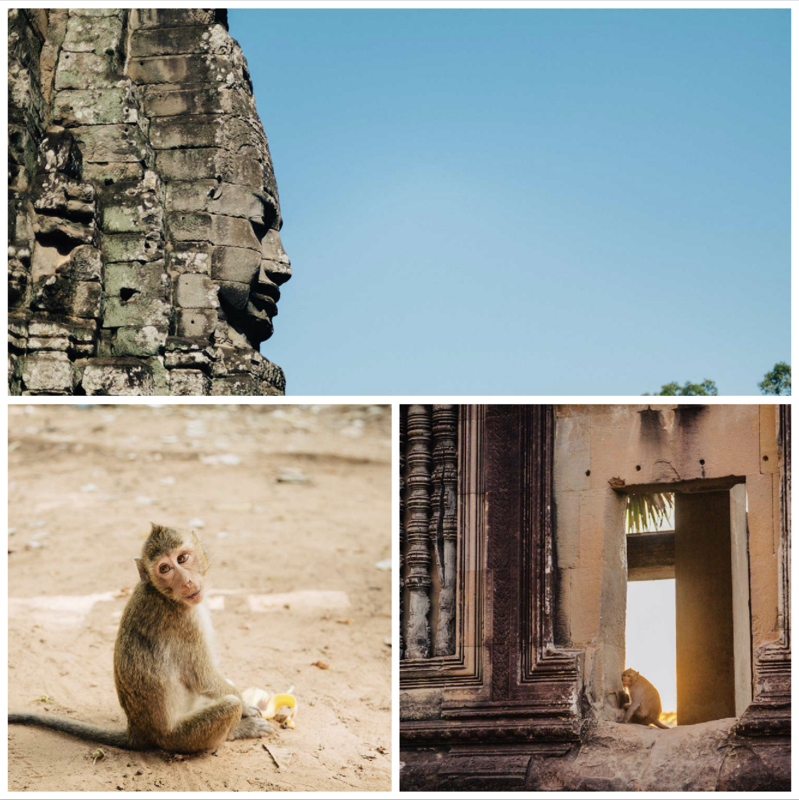 0 Comments on "7 Tips for photographing Angkor Wat"